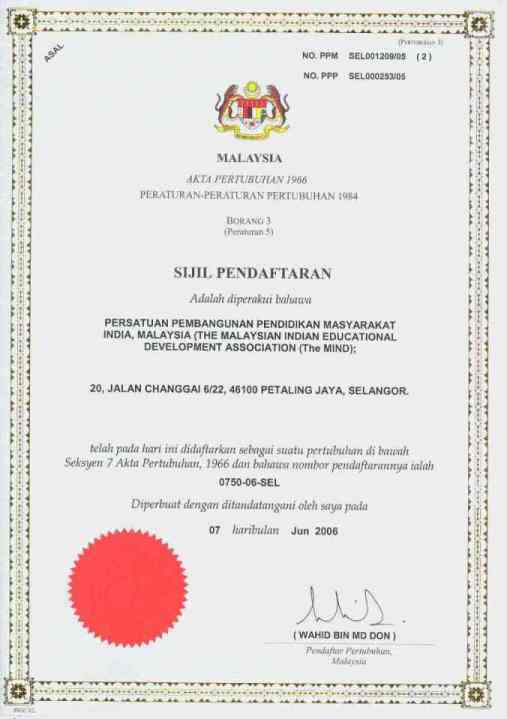 TheMIND or The Malaysian Indian Educational Development Association is a non-political and non-profit based NGO which is established on 07 June 2006, registered with Registrar of Society Malaysia (PPM 1209/05). The association is aimed to help the community in area of education either formally or non-formally delivered consisting of members who believes education is one of the core factor of a progress of a society.The association is maintaining close relationship with many academic experts and experienced personnels from various field within and outside the country to work together to reach the association's objective focusing on academic-driven initiatives. To identify Malaysian Indian Community's problem in education; either formally or non-formally delivered and proposed solutions towards achieving excellence. To provide educational counseling and welfare for the members of needy Malaysian Indian Community. To promote education; either formally or non-formally delivered as the key for advancement which would enable greater participation in the development of the nation. To conduct research on education issues that would contribute towards the well being of Malaysian Indian Community. To publish and distribute books, journals, magazines, newsletters, bulletin and other forms of print and electronic publications for the purpose of advancing the objectives of the Association; subject to prior approval from the relevant authority. To organize courses, seminar, lectures, conference, workshop, dialogue and training for the benefit of all members of the Association and the Malaysian Indian community at large.